Next, the sleeves, ending in a leafy mitt, then leafy center panel—in the dark green. 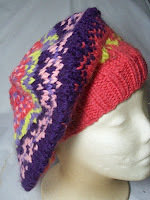 Ending with a hat with a leafy border. Next month—another hat—Sweet Baby—in some pretty colorful self striping sock yarn (I am sure I have some odd (single skeins)) It will be just a matter of choosing one. The border worked out perfectly (I didn't actually count or plan!) 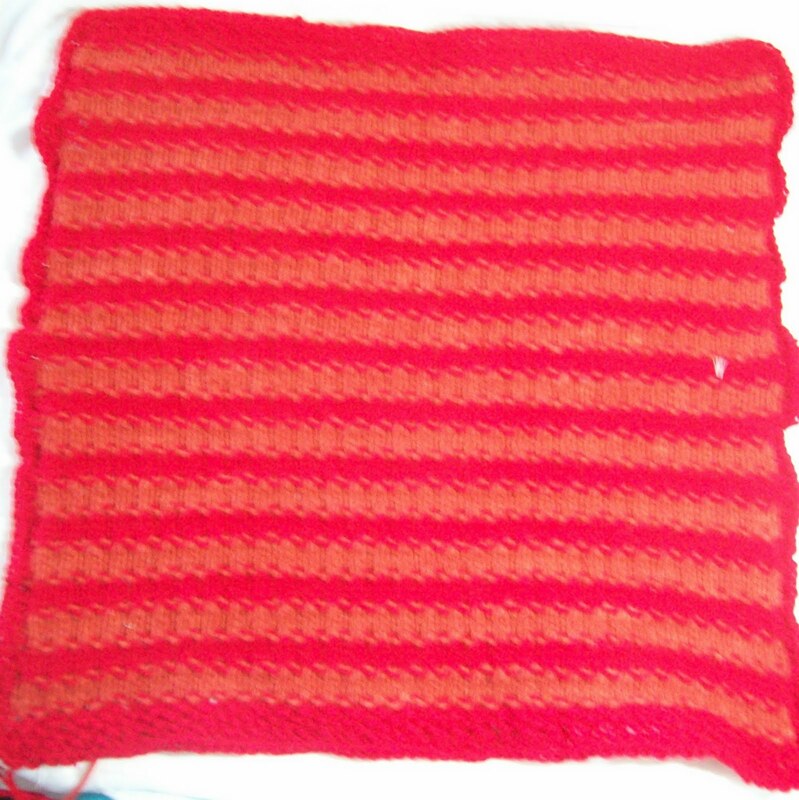 and meets mid back at the first/last row of the pattern. 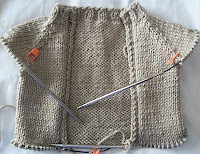 The 6 stitches (now on stitch marker/holders) will be grafted and create a seamless finish. The Center panel will be knit from the top down with a slightly shaped (scooped out) top edge, and will end in leaf tips. Baby sweaters are such fun to knit—so fast! And so simple. 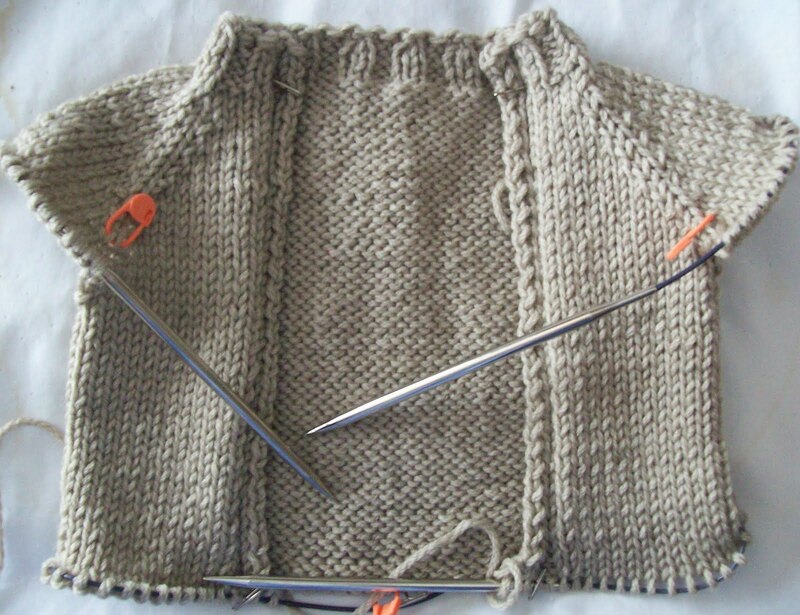 I didn't bother with short row in the sweater back –baby's sweaters really don't need them. The front panel will be an easy one—I plan to use snaps, not buttons to close it. I want to knit a huge shawl—I have lovely hank of lace (almost cobweb weight) merino in white—over a mile of yarn—and I have a newly engaged to be married daughter—and almost a year to complete the project... BUT (and its a real big BUT) I don't think she wants a shawl. Even though she is planning a fall wedding and might really need one. I WANT to knit one. But I don't need a white one. I could, I suppose, knit it and dye it when its done. Merino Wool takes dye readily. It's a bit selfish—It's about me and what I want, not about what my daughter wants—and she's grown up enough to know exactly what she wants—and doesn't need me trying to impose my will. I suppose I could always make a shawl for me. As mother of the bride, I could could pull off a simple dress and an elegant shawl. I really hardly cleaned at all—all summer. I started out cleaning the terrace and doing some re-arranging to make room for all the chairs and planters from the terrace to indoors. The work out there is progressing—or so I am told. All the railings have been removed, but they need to clean and then paint (with special water proofing paint) the terrace floor, and ceilings (actually, ceilings first) and then finally install the new railing. The jack-hammering is for the most part has ended --there is still noise—but not so much. Then there is scaffolding and construction cloth—the whole process has been dusty. The terrace windows have been shut—but the dust travels. By the end of the summer, every room was coated with gritty dust. Slowly but surely, shiny surfaces are re-appearing. And I have been cooking. I hate cooking for one—so I try to pre-cook in bulk and freeze. Then dinner is easier--quick reheats in the micro wave--with microwaved steamed veggies--and hardly a pot to wash for fancy bit of food. This week there is also some red meat—low fat ground beef—again family pack size on sale—1lb. became mini meat balls, the other 2 lbs. became 'crumble'--cooked and drained beef the will quickly morph into tacos, or simple stroganoff, or a quick chili (add canned beans, canned salsa style tomatoes, and a bit of chili powder—simmer 5 minutes) Enough for chili today--and enough left over for day two. Come the winter, I'll make real chili--but quick chili is still better than the canned stuff. Chili, almost always--is served with corn bread--I always have a few boxes of Jiffy corn bread mix--I've had better corn bread--but not often. The Jiffy stuff is top notch. I try to eat fresh fish once a week—salmon sometimes--(but I really don't like salmon) tuna as infrequently as salmon—My favorite is cod--(and every spring a pound or two of dried salt cod finds it way into my pantry) I don't much like herring either--but that's it--I'll eat just about every other variety of fish, and almost every other sort of sea food--it really depends on whats available (and on sale) About once a week/every other week, there is an all vegetarian dinner—or one with eggs or cheese. Does anyone but me remember peppers and eggs Italian style (with a red sauce)? Chunks of peppers and onions in a tomato sauce, and an egg poached in the sauce as well. I like spaghetti with oil and garlic too—some times with a dusting of fresh grated cheese—or sometime home style with breadcrumbs. It's still a bit to warm to be making soup--but that's up next-- I want some spicy soups this year--some mukkugatawny, or some ginger/lemon grass ones. Lately, I just crave spicy foods! Oh, have I made you hungry? Well it's been aromatic around here! My freezer is once again packed with prepared ingredients for quick entree's!--I love having a larder full of good to eat food. And then there is this—A little sweater.. Since it was photographed, half the lower edging is finished—a leafy border in green. 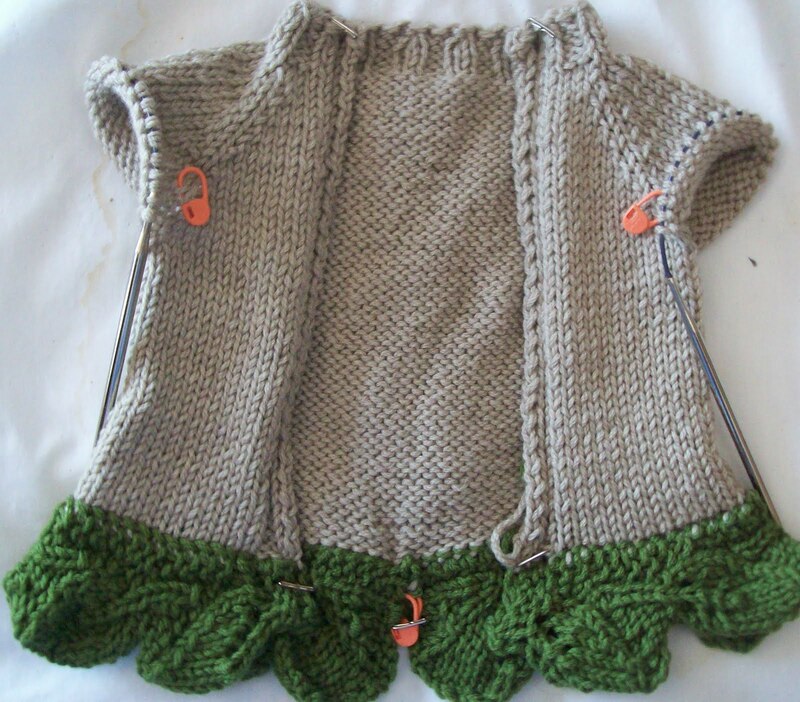 The sleeves with have leafy mitts and the center front panel will be more green leaves—all for a little sprout. There will be a matching hat, too. All this for Jennifer and Guy's new one--(there will be more!) All in a machine washable wool. I want to get it finished up—Saturday is a new month—and time for new socks! I have to pace myself, or it would be all socks, all the time! Sunday is going to be a new knitting group—one at the Rego Park Shopping Center Panera's—starting at 2 PM—and going to—when ever we want! You can come too! I haven't told you about the blog contest I won! First off—I pass on many—I really feel lucky to have had a good stash to start, and to have inherited parts of two others—and I know there are many who might be earning more than me—but are just starting out—and doing so loaded with educational debt—and need to win more than I do. But this was a great contest—with 3 first prizes. I know, because I won the third prize and WOW. First the wool—Fiber—because a blend of 60% suri alpaca and 40% wool, is most alpaca --and more correctly called fiber. Look at this skein—over 600 yards of yumminess. The color name is red clove and it's spot on. I had a lace scarf in my mental queue, now I have to add a real shawl! 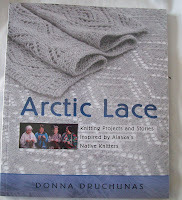 And as wonderful as the fiber is—there is this—Arctic Lace by Donna Druchunas. This book has 2 main parts, the lace patterns, most simple scarves and tubular hoods, (even the moibus is done scarf style, twist and seam) but there are some lovely new lace patterns—and really, after 50 years of knitting, finding new lace patterns is a joy. Behind the boat, is the hall of Pacific Northwest People—which cover from Oregon to Alaskan Pan handle—and not much more. The Museum of the American Indian --1 of 2 parts of the Smithsonian museum found in NYC--(In the customs house, on lower Broadway) has some more info on our norther most state—but not much. This book has information about arctic Alaska—about individuals, towns, groups. It explains how the designs came to chosen, and other details. 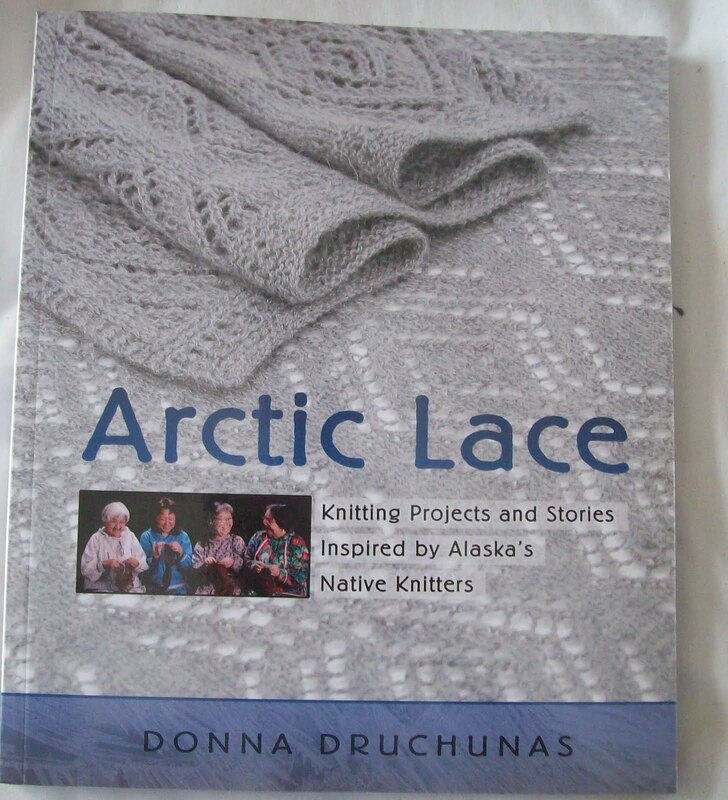 I don't care that the focus is on fiber arts (some of the lace designs mimic designs sewn into fur parkas, others mimic designs found on bowls woven from grass) –I am perfectly OK with having parochial knowledge of Alaska to start! Subtly is lost on me. I like my colors and patterns bright and clear,with lots of contrast. But you knew that already, right? 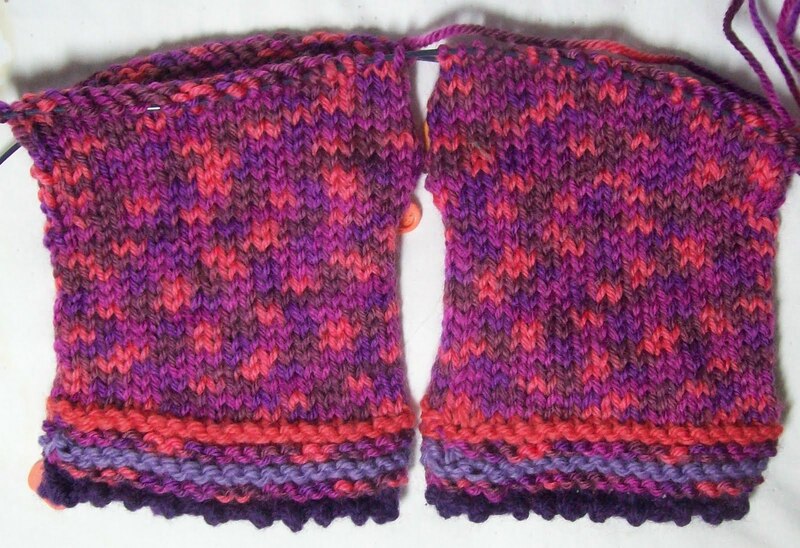 And look, fingerless gloves started (and all too soon to be finished). 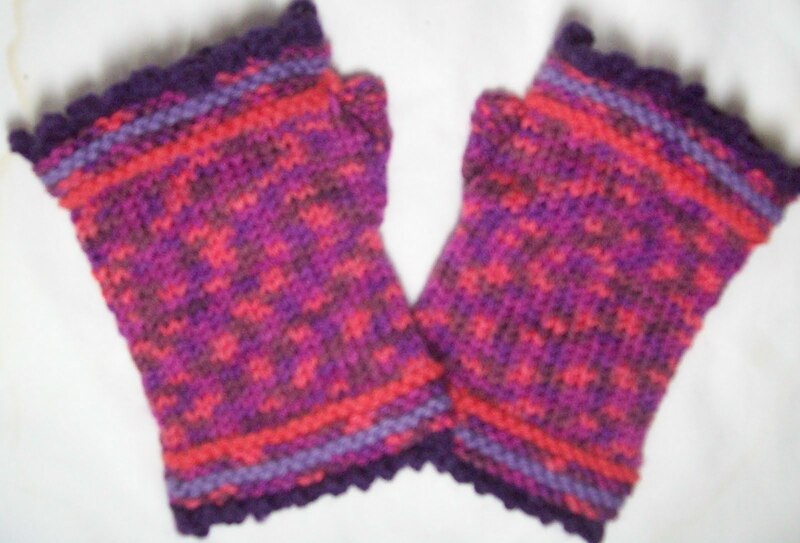 I had some sort of brain fart—and imagined I could make long sleeved fingerless gloves from the skein of tweedy/multi-color yarn. But how could I? It was a single 50gm skein—a scant 100 yards; divided, 50 years per glove. Nothing to knit with! Oh, I know, I could have added stripes of the colors I used in the cuff (and will use again at the knuckle end of the glove) and made them longer, but I really didn't want stripes. I could have made them snugger and gotten another round or two in length... But really nothing I could do would make long sleeve fingerless gloves out of 50 yards/25 gm of yarn. It's OK—there are plenty of other yarns in the world (and a good percentage of them live in my stash!) and fingerless gloves are fast to knit. So these are another short length pair—they are pretty aren't they? Can you see the head of a safety pin like stitch marker (in the space between them)--That a large stitch marker acting as a stitch holder for the thumb gusset stitches. Today I'll finish the matching garter border, and weave in the second set of ends –(Yes the first half are already woven in!) and these will be finished. I still have a pompom to make for the hat. But there is no rush—it's been dreary and grey and rainy round these parts—but its also been 80°(f) (somewhere in the 20's° c) The rain is moving on (a good thing—there has been way too much of it! If I had my way, some would have been shifted to Texas and points south). Next up is going to be a quick little baby sweater—for Jennifer and Guy—My DD's best friend and her husband who are expecting their first in January. Something simple—and made from machine washable wool, and unisex—she is expecting a boy—but who knows, there might be a second child in the future. There will baby hats knit too, in the next few months—January is mid winter, lots of warm hats are a must—besides baby's hats are so fun to knit.. little elf hats, or sweet baby hats, or fruity hats, or vegetable hats... Baby's have no choice—all you have to do is make something adorable, and mom will pop it on baby's head! OK, so the hat's not done--though if I paid more attention, and didn't make stupid mistakes (and frog2 or 3 rounds, 2 or 3 times!) it might have been. The center of the crown will be more of the Current(dark peach) and with some of the Ginger. bring the the Current back to the top of the hat. The dark purple is left over from Lady February. The Lemongrass and Wisteria—just odd skeins I've picked up at sales. The Lemon grass was very cheap because it was missing a label. It's a pretty intense color—a little goes a long way! The stitch patterns—just ones that grabbed my fancy—and fit the stitch count—which is, (lazy!) always based on 10 (well not quite true—the cast on was 96—but it quickly became 100), then 110, and eventually up to 130, before I started the decreases—which like the increases, are based on units of 10 –a few rounds of no decreases--(pattern work) followed by a round of doubles (20 decreases in a single round.) 10 is a number I know that works for me--it creates a flat disk--almost perfectly. And that's how I like my berets! I added the very non traditional picot to the fold line-- I like the sawtooth picot edge. Finally there is this multi color skein (another odd ball!) --which goes well with the purples and peaches-I haven't decided if I am going to use all 5 colors, or just 2 +1--(one each of the purple and peach—and the multi) And after all is said and done—the last bits of the solid colors will be made into a huge pompom for the hat. 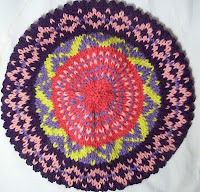 Its a big hat (over 10 inches across) and I don't have too many hats with pompoms—so it will be good. So that is—a bit of knitting done—and off to do more! A love 'slice” of pumpkin pie (or rather 2 slices!) are being served up! 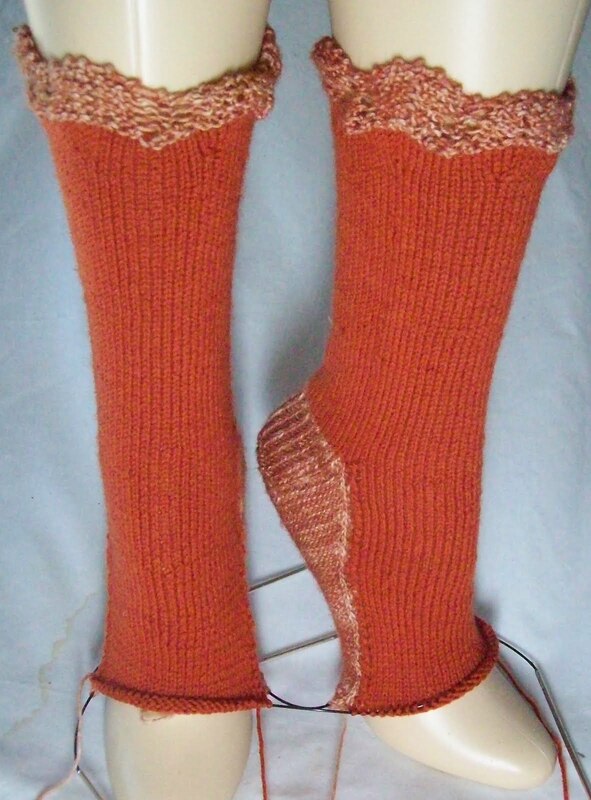 They barely fit LEGS--(you can't see the crust at all at the tip of the toe) –but the idea works—The side view shows clearly how the gusset looks like the slope of the pie plate—and the smooth stocking knit looks like a creamy custard. The side seam has just a thin exposed edge of crust--just perfect! I think I will end up making some more pies--maybe a lemon meringue, or a key lime, or a mississippi mud pie--or some other flavor. I like the idea of these socks--even if this pair doesn't fit! 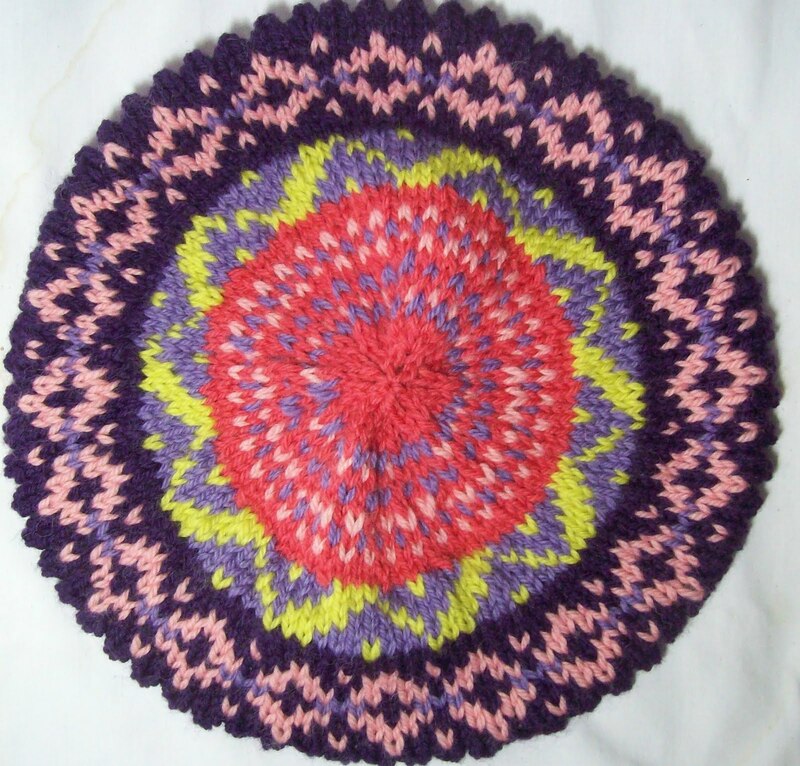 I didn't do any work on the beret—except to double check the stitch count and look through Alice Starmore's book on Fair Isle to find some perie stitch patterns--this was done with a pencil in hand—counting the stitch repeats. She sorts pattern by the number of rows each pattern uses-- I care about repeat count—since I am not interested in frogging the 3 inches of brim I've knit twice for 3rd time! 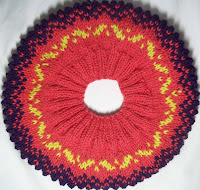 I need a stitch pattern that fits my stitch count! I'll take a photo of my color scheme, and the under brim tomorrow—Who knows, I might even have a few round of the top done, too, by then. And I'll take a photo of the co-ordinating yarns for the finger gloves—which will be LONG—knuckles to elbow—long enough to make a snug 'sleeve' to wear with Peachy or Lady February. Both of which are warm enough to worn on cool fall evenings—but since they will likely be worn with short sleeve T-shirts or camp shirts—I do sort of, sometimes need something for my lower arms as well. I have 8 days to finish the hat and fingerless gloves—then come October—Crazy time! Crazy 8's to start—Black yarn as the base—before I bought my Ott bulb for a lamp, I wasn't sure what color yarn I was going to use as my base—I've knit with Kroy black, (Coal/Carbon) and it's a very black black (like the Monty Python skit about black pudding, it a very dark even black—even the white bits are black) Black is a hard color to knit with—the stitches disappear! It's the perfect base for a colorful sock—offering a great background that will make all the other colors POP. And I do have a fair bit of black in wardrobe—and with 8 other colors—these socks will go with anything! With good light, black won't to to difficult to work with—I hope. What else will I knit in October?—So many ideas, so much yarn, so difficult to chose! My kitchen is returning to a semblance of order—all the things I took out during the summer—and failed to put away when I was done with them—have been returned to their proper homes. Now, low and behold—counter space is once again available! I don't have much to begin with—my kitchen is, like many in NYC—postage stamp sized--how small? I can fill a pasta pot with water when it's sitting on the stove—the stove is close enough to the sink, the spray arm can reach it. And I can't open the dishwasher and refrigerator at the same time (the doors share a space) –plus the dishwasher is not a standard 24 inch one—but just an 18inch one—plenty big enough for a family of one—but smaller than the average dishwasher. Well, crust toes! Now a few rows of pumpkin custard, and the socks will be done! I think when finished, the socks will actually be too small for LEGS—but that's OK—my granddaughter has small feet (it must be her mother's side of the family!) she a bit petite in general. Or perhaps just normal—both of my children were always ahead of the curve when it came to height—age 12 (my granddaughter age) my daughter was –at the beginning of the school year over 5 foot tall—and by the end of the year almost as tall as me (5'5”!) and the third tallest girl in the class. 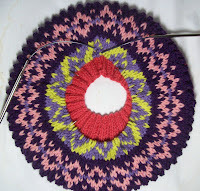 So I should finish up the socks today—and get started on the fair isle hat tomorrow—or maybe even late tonight. After that, MORE socks—cause—well every month brings more socks! A vest, too, is on the agenda for October. I started looking last night for pattern—and found 2 I sort of like—but neither was exactly right—but one inspired a design—a weirdly shaped single piece that is mostly back—but also forms an arm hole and a bit of front shaping. The rest of the shaping will be a circular band. The yarn? A multi color one—Lion Brand's Amazing—I love the shrug I made with this yarn, last year. Love the color, love the fit—but –and this is an odd complaint—it's a bit too warm! I am sure there will be cold days, or days when fatigue or illness leave me chilled to the bone, and I'll love the cozy warmth. But more often than not—it will be too warm. But a sleeveless vest? Perfect—enough to warm the core of my body. Enough to wear under a light jacket—or to wear alone in the car. I really hate driving in heavy coats or jackets—but I often want more than just a shirt or T-shirt. I have the noro vest—but—pretty as the colors are, I don't like this vest much—I know, I know, Noro changes on its on schedule, and trying to make matches with Noro is like trying to herd cats—but I really don't like the lack of matching fronts. Oh, I'll wear it, but it's not something I really like-it will end up a house sweater—rarely worn out. I've been working on a 'wish list' of things to knit for the winter and coming year. The sock list already has 14 ideas—7 simple easy ones, and 7 fancy, complex ones. 2 are left over from the list I made last January, and I expect by the end of next year, there will be some left over again. You'd think there would be a pile (or at least 1!) FO to show for it. But no.. Not much knitting, and no photos –well maybe 1 short silly video. Went shopping—odd and end, and grocery shopping too. Went to the Maker's Fair, and taught knitting and bit of needle point too. Totally forgot to take any photos! --But my DIL Sonya, received a Blue Ribbon (editors choice!) for her display. I planned some knitting... Of course I first have to finish the pumpkin pie socks--(they are going to go to my granddaughter). Then a fair isle hat—One is started, and frogged, and started and frogged, and started again--(and never got to color work, just a bit of ribbing) and a pair of fingerless gloves to go with the hat—not fair isle, but a multi color (short lengths of color)yarn that matches well. The hat will also match my Lady February Sweater and the Peachy Sweater--I know it doesn't seem possible--but wait, you'll see! 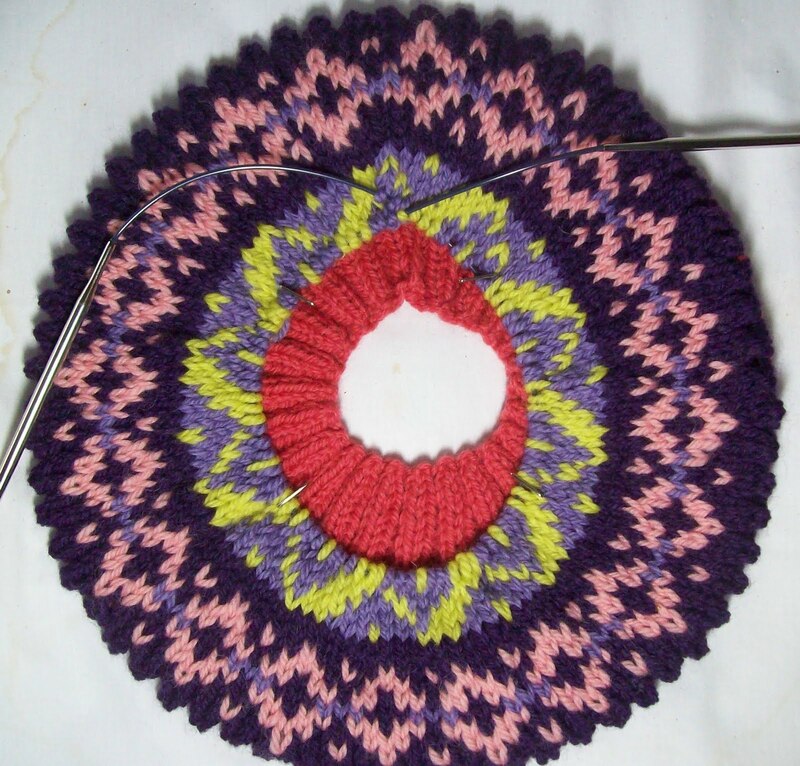 It will be simple fair isle—a bunch of perie type patterns, --with a plain (decrease round) or two between each perie pattern. Well there are a bunch of promises.. I hope I keep them! They are looking like a socks—and at the same time, it's looking like a piece of pie. I like it! I suppose if I knit the sole separately, it would be finish by now. But I am glad that I chose to work the instep and sole simultaneously. Because I would have gotten it wrong. This is the first time I've knit a sock too small. And it is definitely to small for my gunboat feet. There is plenty of stretch in the cast on edge, and I can pull the socks onto my feet, but I don't like how they look. They look good on LEGS—they fit LEGS—They even have to be stretched a bit to get on LEGS. But stretched out, to fit my feet they are less attractive. The knitting opens up too much, the smooth stocking knit stretches out and doesn't look attractive. The side 'seams' open up too. It's not a good look. Well the good news is: My granddaughter is coming to visit—and she is age 12, and has smaller legs and smaller feet. They might be a bit loose on her (especially the leg part of the sock) but the foot is even narrower than the leg, (finished, less than 7.5 inches) –and should fit her about as well as they fit LEGS. One nice aspect of the socks is that inside a shoe, the contrasting “crust” won't show. They will just look like normal socks. She might or might not like the idea of pumpkin pie socks—but since it won't be evident—its won't matter. Living in SF, she doesn't have much of a need for wool socks—But my son and family camp—in the mountains—on a regular basis. 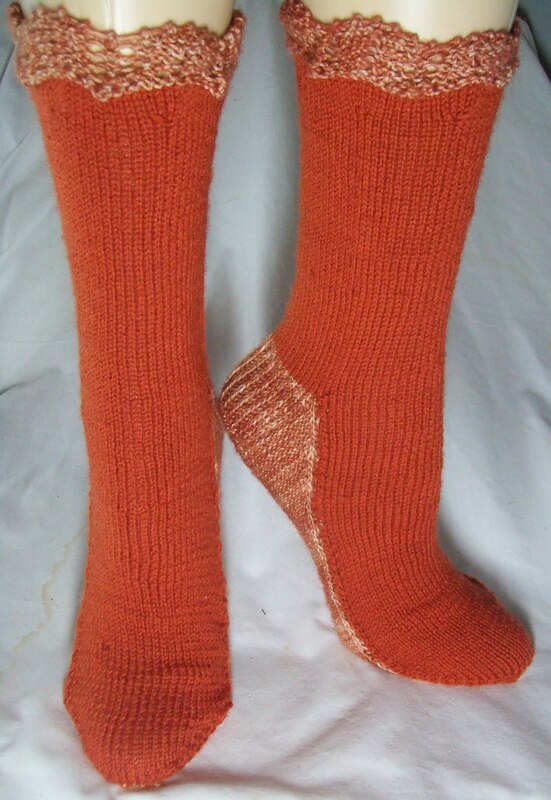 Wool socks are perfect for camping and hiking. She'll be able to use them then, if no other time. for democracy—I voted this morning (after breakfast, before errands) Pretty sad, too. I live in a 6 building co-op, there are several other co-ops in the area (4 building, and 5 building ones) All built around the same time, they are almost identical in size (building size) and lay out. Each building in the respective co-ops has 14 apartments per floor (A to N) and 14 floors (all skip floor 13, and end with 15. ) over 1100 units in my co-op in groups of 6 buildings; just under a 100 in the building group of 5. A lot of people in a very small area. Even if you presume 1 voter per apartment (and since some apartments are 2 and 3 bedroom ones, that is a low average, AND presume, that 40% of the people can't vote (the neighborhood has a high percentage if immigrants) that still leaves thousands of voters in my district. But when I went to vote? I was number 26. At 10 AM in the morning. The early voters—I used to be one—vote on their way to work. The stay at home mothers with children to get to school, would have (if they were going to) walked their children to school and cast their vote then. But 26 voters? Turn out is (as in all special elections, and primaries) low—very low. Allegedly, it's a test-—Will the district remain democratic, or will Tea Party candidate Turner win. But enough politics.. I got a scant 8 rows of my sock done.. the sole is less than an inch longer, as is the instep. I better get to work—The month is rapidly going away—if I don't get cracking—it will have gone by with nothing to show for it except a single pair of socks! I was working downtown. Both before and after the WTC collaspes. Close enough, that I frequently walked to the subway station (E termimal) in the WTC. It was a longer walk than the closest station, but a faster express train. In the long dark months after the collapse, I wrote this. The “pit” as it was called, burned not for days, but for months. Till the beginning of December—and everyday, there was smoke and dust, and the smell. --One word has been editted—at first the totals were thought to be higher, and five (thousand) has been corrected to 3 (thousand). I am nothing more than star dust. From such stuff to be born. My city is a charnel house. Of stardust, I am no more. The Heel is the worst! All those extra stitches in the gusset,and decreases. And–as soon as its done, I feel like the sock is almost finished. I don't feel that way yet. The remaining gusset stitches got picked up, and I am now decreasing my way back to the original stitch count—slowly, So SLOWLY! 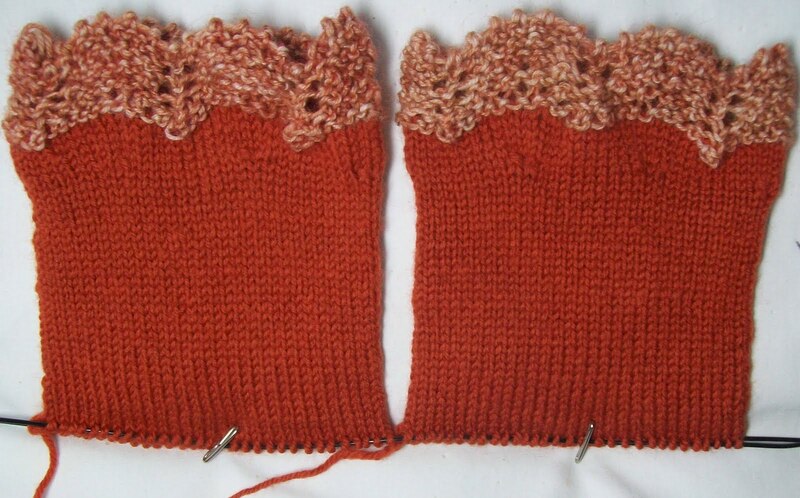 A dozen rows of the gusset done—and a dozen more to do. I do like deep insteps, and long gussets PITA that they are, are a must! And at the same time, I am working the instep- First 8 rows of the gusset, then 4 rows on the instep, then 4 more on gusset, and 4 more on the instep. It's following along, slightly behind. By Monday, I should have enough progress made that I can put the socks on to LEGS—and let you see. 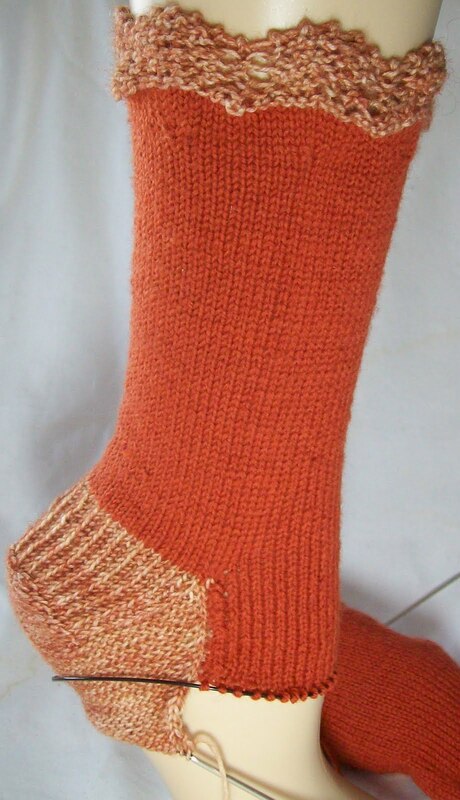 Right now there isn't enough of a foot(sole) or instep to hold the socks in place at the LEGS heel. I like how the socks look, with the crimped crust top—but thinking about it, the 'crimped crust' is totally disconnected from the (still to come) crust on the heel and sole. What if.... I started with a mostly white (the whitest white I can find) and then hand painted just small amounts of beige in the white? Then I could have a top cuff of “browned” meringue! Followed by a lemony yellow, and the same toasty beige sole, I could have a lemon meringue pie sock! Or plain white on top, and lime green, it would be a key lime pie with a whipped cream topping, or white and 2 shades of brown, and I could be knitting up a Mississippi mud pie, Add some texture –via a stitch pattern, and use a semi solid medium brown—Pecan Pie! An impractical white sock—made with a with a beige sole? Why coconut custard! I could knit up a collection of pies. And since I have plans for a cookie sock (no more details yet!) I could do a whole bakery collections.. Hamantashen pastries as a fancy cuff, or maybe curled up ruggalahs or bear claws—so many choices! Why not? 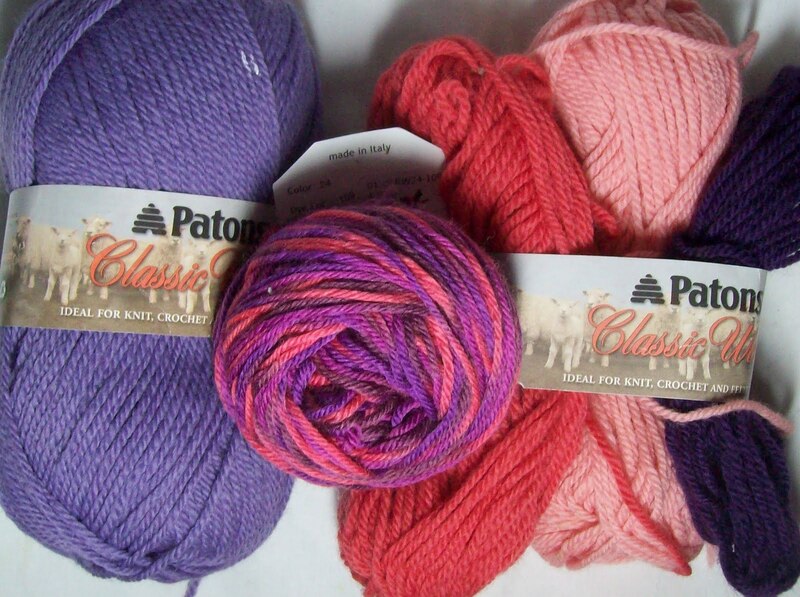 If I can knit Italian ice socks, why not a half dozen pairs of socks inspired by bakery shelves? 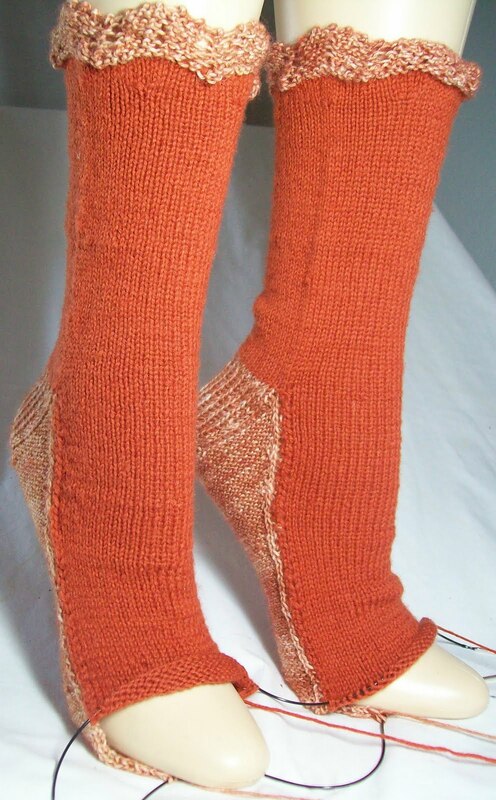 I could make a new pair of pie socks every year for the next 10—and still have ideas left over! A pie shop collection! Another inch of pumpkin "custard", and I'll be starting the heel and sole of the toasty brown crust—and who knows, maybe I will break the plan, and add a few more pies to my sock collection before continuing! Yummy—and calorie free too! I live in the north east of North America—so I have (and tend to think of the year) in 4 seasons—Fall, Winter, Spring and Summer. Fall is always the beginning of the year. It started being so when I was a child—Fall was the start of school-- New grade, a new teacher, a new start. I married young, right out of school, and I married a teacher—the school schedule continued to dominate my life for the next 20 years. And now, 20 more years latter, it still does. I love all the seasons, the changes, the special things I associate with each season, but as the growing season comes to end, it's time for a new year to start. Certainly, fall is knitting season—and this fall is full! There is Stitch 'n Pitch (I think I am going) on September 13th—this year the knitters are yarn bombing Citifield (I have to stop and think—what I want to type is 'Shea') –followed by (the same week really) Maker's Fair (less than a half mile away!) in Flushing Meadow Park, on September 17th and 18, October starts with Rhinebeck, (I want to go, but I don't think so), immediately followed by Stitches East (in CT) -I am not going-- and there are two breast cancer walks (I am doing one) in there too. More about the breast cancer walk later this week. November? Its time to get serious about holiday gifts.. and December is crunch time. But truth be told, I don't do a lot of holiday knitting. Then there is ME knitting time. The dark days of winter are the perfect time to hunker down with wool and knit. I've already make plans and some lists--(I always make plans and lists—I frequently ignore them, I do make them!) I have a list of 14 sock ideas (2 are roll overs from last years plans—both generic socks involving self striping yarns) –and more new ideas have sprung up since I started the list. There I sort of things I want to Knit, starting with a nice, warm winter sweater jacket. I like sweater jackets.. (I don't know if I I like knitting them, but...)I want it to be Big—with long sleeves--and turned back cuffs, and pockets, and a deep collar. Some cables, too, (but not too many), loose enough to be an outerwear jacket, and densely knit too. I KNOW I won't get everything on my list knit And that as full as the list is, more things will get added to it, and some of those new additions will jump to the top of the list. 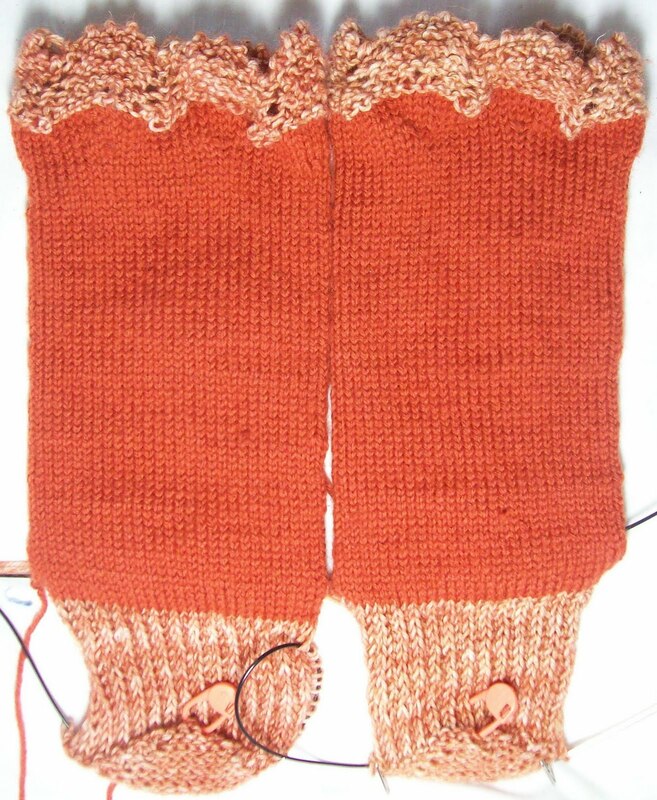 Meanwhile, my pumpkin pie socks got started, ignored, frogged and restarted (a lot of changes in 6 days!) and now are on their way. So far, just a crimped crust of toasty brown, and a smidgen of dark, spicy custard—But on the way. The crimps in the crust caused the problem—I wanted something different than the Crowning Achievement sock top—and it took a few tries to get the crust right. Textured, and undulating, but not pointed. I used the same channel island cast on (it's a super stretch one as well as being attractive) but worked the cuff in garter, and rounder ripples for nice effect. For the next day or two, its easy going, just plain stocking knit.. But the starting at the heel, the sole will be 'crust' (brown) and the instep custard (pumpkin) Very Pie like indeed! 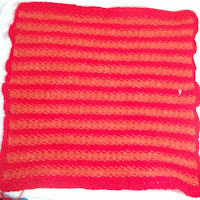 A little less than half done when I took the photo (8.25 inches) but since then, a few more rows were added, and now it's a bit more more than half done (11 inches). The stripes are a more evident when the knitting is in hand, but the hues of the two reds are close in value and from a 10 feet away (or half that distance with my eye glasses off) they do look as soft and subtle as they do in the photo-- Partially because the colors are close, partial because the stripe have blurred lines. Just enough of a pattern to be interesting. Not quite enough to keep the fabric flat—but close. I did some similar stripe blocks last year for the Maker's Faire Project. Which reminds me (as did Sonya) on her face book post-less than 3 weeks till Maker's Faire! I didn't much knitting done yesterday –I went to the pool and afterwards, Panera's for a few minutes. August has been cool, and Irene busted a weekend and then some. This the last week of the pool. Some of the petty problems became slightly bigger ones. There are some parents who let their children run wild and unsupervised. I think that the young woman is basically OK—a bit bruised--But not broken. But her grandmother/guardian was very upset.. partly because no one at the pool knew anything about it. There was no one downstairs (in charge) and no one on the deck realized what had happened. One of the set of kids involved—boys aged 5 and 6 totally denied any involvement(but I had seen one of the kids definitely running away from a lifeguards (who was ordering him to stop running) bucket in hand (near the staircase) and the other kid downstairs laying in wait to “attack” (superslooper type water gun in hand (and the floors were dry). When I came out from the lady's room, the kids were gone from downstairs, and the floor was wet. These kids are generally nice kids-considering that they run wild, and are virtually un-supervised by there mother. The kids are constantly breaking the rules—they run, they sit on and 'tightrope walk' the pool ropes, they help themselves to any toy at the pool (more than once taking my noodle to “play with” with out permission). Mother sits on the deck, talking on her cell phone, or gossiping. In 3 years, I have never once heard her reprimand her kids for breaking the rules. Again she is nice enough—but it's a pattern. Yesterday the pattern ended up with a problem. It began to get dramatic—but I left (as did the mother of the two boys—only the grandmother/guardian of the teen remained, venting anger at the situation to the pool management (she wanted an incident report). At Panera's, were saw Doreen Lynn Saunders—I've posted about her before (but I realize after, I had her web page URL wrong) her web page is The Americana Stars Memorial. Doreen is doing a huge project to honor all those who died in the world trade disaster on September 11, 2001. I am glad to have seen her again—and I love her project. There are so many projects, so many things demanding our time, our attention, our MONEY, but here project is one I think deserves more of of all three!